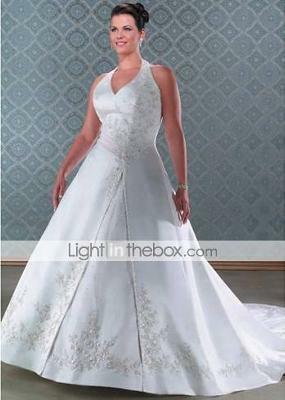 I needed a plus size wedding dress! I needed a plus size wedding dress myself and after trying on a couple of gowns that just didn't do me any justice at all, rather I didn't do the dresses any justice would be more like it, I knew I needed a pro before I went out on my next shopping excursion. I had a lot to consider when looking for my gown. First, I'm short. 5'1.5" to be exact, much shorter than what designers consider the average bride. Next, I'm sort of on the large side and when I'd look at the size charts for several different styles of wedding gowns in the larger sizes, it made me even more frustrated. My body shape doesn't fit into any particular size category; it sort of wanders all over, so when I buy clothes, in order for them to fit around the middle comfortably, I have to tolerate them being too large and much too roomy everywhere else. Trying a gown off the rack was certainly not turning out to be a feasible option for me, but I persevered. And I turned to a professional online for some much needed advice. The tips and advice that I got from Desiree at The Perfect Wedding Dress Finder helped put me right into a gown that I was actually able to try on at a local salon! I printed out several style suggestions from some photos online, then my daughter and I went to a local salon to see what they had. My daughter actually picked out the gown for me and when I tried it on, I just wanted to cry! All this time I thought I'd never be able to find a gown to fit my shape without spending hundreds of dollars in alteration fees on top of hundreds more for a plus size wedding dress. But Desiree knows exactly what to look for based on her experience with fitting plus size brides, and I have her to thank for being able to know what to look for, which enabled me to find my ideal gown - one that fits perfectly on my more than imperfect body.